First came the morning meeting, like any other morning meetings we were lightly briefed as of what today might bring, like we got basic information of where, what and when, but we were also told that there was a change in the schedule. We got the honor of watching the Japanese archery club at Kansai University in action. As we grabbed our “best friends” – our schedule and pen – we wrote the changes of the schedule, as instructed. After arriving we met up with a couple of guides of the Kansai University. The entrance was a huge gate that also looked like it also functioned as a bridge. There were also huge buildings everywhere, like the library which is supposed to be the oldest building of the university. The guide explained to me that there are about 35000 students attending, whereof 700 of them are foreign exchange students. The majority of the exchange students were from around Asia, most of them China and South Korea. We took an elevator and walked around a bit, but in the end we were lead to a classroom. The Kansai University representative was standing there ready to have a presentation, which would have me view Japanese university students in a new light. But first of all, she spoke English like a Native American, supposedly because her husband is one. I think one of the things that surprised me the most was the fact that in Japan, over 70% of the students have a part time job. It is often not to pay for living expenses or tuition fee, but in order to get the hang of how society works in japan. In order to accustomate, apart from the part time jobs, there are club activities as well, and with these activities they learn about the hierarchical system of japan, starting by forming senpai – kouhai bonds. The saddening part was finding out that in Japan, the interest in living outside the country is dwindling. Most of the Japanese people don’t take as much interest as they could have, and therefore there aren’t many that travel outside the country. At the same time the fertility rate in Japan isn’t a sustainable one, so there are fewer members of the newer generations, and thus more seats at the university that might be empty in the near future if nothing is done. One of the solutions of filling up the seats of the universities, are the contracts Kansai University has formed with other universities across the world, including Sweden, Denmark, Holland- and if I play my cards right, soon Norway as well. The Japanese students do have interests in short time stays and exchanges with other countries, which compared to the long term programs is getting increasingly popular. The presentation went by pretty fast, and during and before it we were introducing ourselves to the Japanese students who had cared to join us for the program we had for today at the university. We were split into 6 groups, where each of the groups were accompanied by a couple of Japanese students that tried their best to explain, and answer our questions. 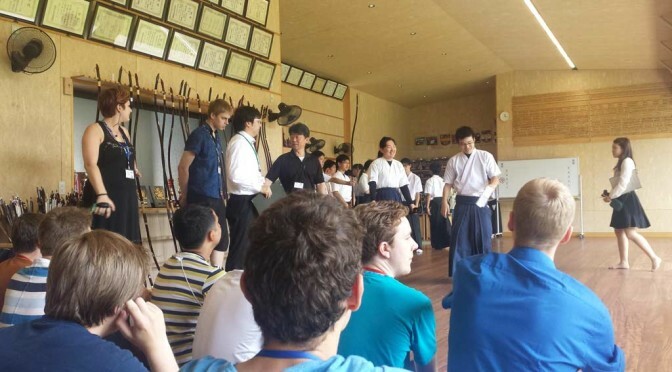 After the presentation, the students and us were lead to the Kyubu, the Japanese archery club. We were lucky enough to see a real Japanese traditional archery ceremony, performed by a girl all by herself, after which the team captain had held a speech welcoming us there. It was an amazing experience. The archery club practices on targets that are roughly 28 meters away, and watching her perform such a beautiful ceremony, made our blood rush and made us want to try for ourselves. The archery club gave us the chance to try out Japanese archery, but on the condition of us playing it safe, as it is possible for people to die if one isn’t careful. Just so you know I did hit the target! That was 5 meters away… 2/5 times… barely. Well that’s about it, it was very fun, and Im thankful to Kansai University for having us! Arigatou gozaimasu!